Combat Academy is a comprehensive martial arts training journal and app. 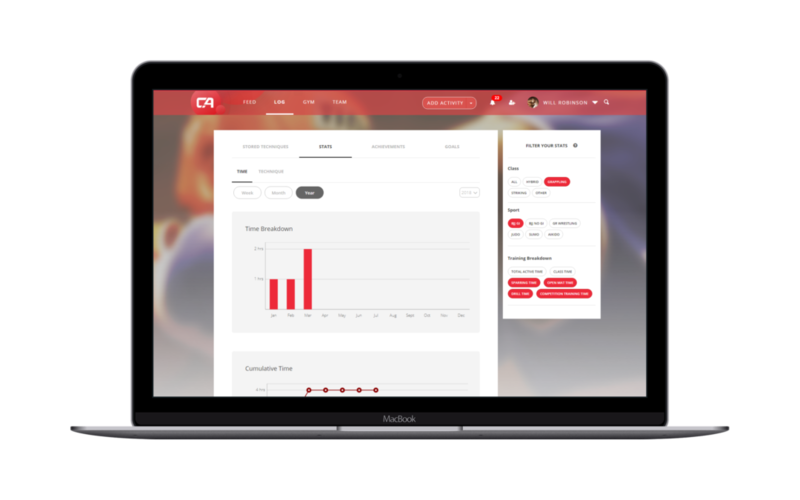 Most of our new users join Combat Academy from our iOS and Android apps and some of you may not even be aware that we also have a very capable web-app. If you have not done so yet we encourage you to check it out. It can be accessed here and you log in with the same user name and password as you use for the mobile app. The web-app works best on a desktop or laptop computer. Most of the screens also work on an iPad. If you only have a mobile device you should continue to use the mobile apps though. Our web-app has some features that are not yet available in the mobile apps. This includes a more powerful people search, the ability to search for specific activities and stored techniques, the ability to use custom tags for your stored techniques and, not least, the ability to view charts of your time and technique stats. The time based stats allow you to visualize amount of time spent on activities, over a week, month or year and compare these to previous periods. You can use filtering to zoom in on specific sports, types of activities and types of training. 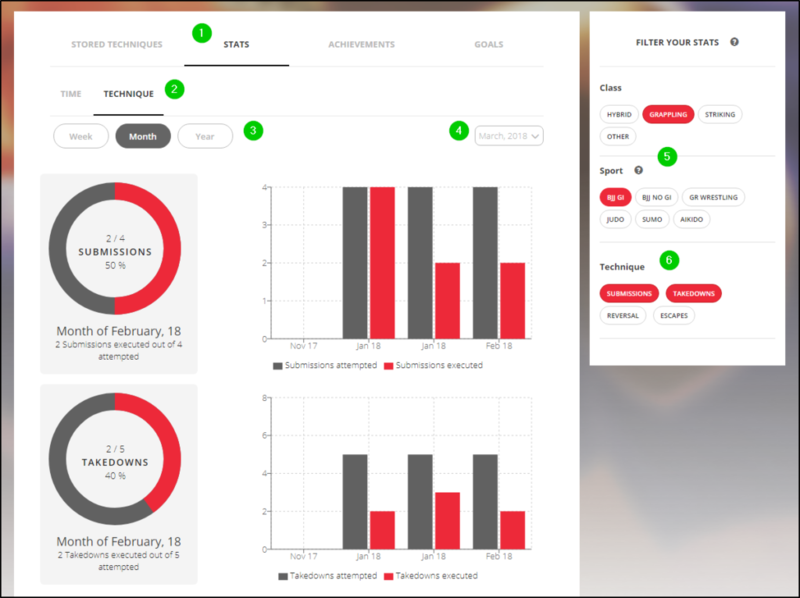 The technique based stats allow you to visualize the number and success rates for different techniques and moves employed during a time period, and also compare this to data from previous periods. In the screen-shots below we give you a quick guide on how to access and use the web-app stats data. Select TIME or TECHNIQUE based stats. In the screenshots below we focus on time based stats. Optionally, apply filtering to the data. If no filter is applied data from all your activities will be displayed. Once you have completed these steps 2 or 3 charts will be shown in the main page area. The time breakdown chart shows total training time for the selected period. If more than one sports class has been selected the different shades correspond to each of the sports classes. The cumulative time chart shows the accumulated activity time over the chosen time period (dark line) and compares this to the previous time period (lighter shaded area). Depending on the filter combination applied an activity breakdown chart may also be displayed. Select STATS from the sub-menu. Select the Class and Sport. Note that for these charts only one class and sports can be selected at any time. Select one or more techniques. Once you have completed these steps one or more charts will be displayed on the main page area. These show the number and success rates of the techniques during the chosen time period and also a comparison to previous time periods. We are aware there are some minor bugs in the current version of the web-app. Please let us know here if you come across any issues and help us make Combat Academy the very best martial arts training journal and app by letting us know here if you have suggestions for any additional stats features. We hope you find these stats features useful as a tool to gauge your training and development! Interested in more tips on how to make best use of our martial arts training app? If so, check out this post.